On this page you have the properties of minerals. In addition to mineral characteristics, there are some mineral properties that you can use in the identification process. This is a very common way to identify many carbonate minerals. Carbonites like calcite, dolomite, azurite, malachite and others react to HCl. Drop a few drops on the mineral surface and it starts bubbling. There are also other kinds of minerals that react to other acids. Always have a magnet in your home kit to test a mineral's magnetism. Typical magnetic minerals are the ones that contain a fair bit of iron. 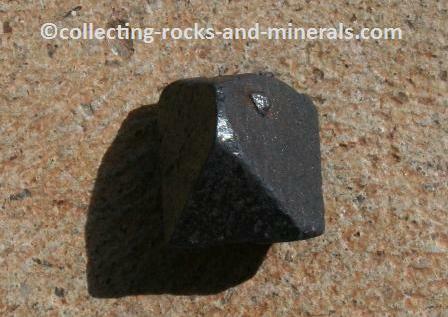 Magnetite is the most magnetic mineral after iron. Hematite is weakly magnetic. Some minerals are better conductors than others. Gold, silver and copper are obviously very good conductors, while non-metallic minerals are not good conductors. Some minerals are radioactive. Uranium is of course radioactive, but others that can be just weakly radioactive are zircon, amphiboles, micas, K-feldspars, feldspathoids, aragonite and calcite. 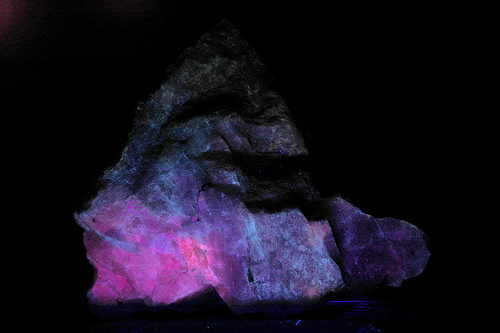 Some minerals are easiest to identify in a dark room under an ultra-violet light, when they emit fluorescence. Such minerals are for example fluorite, scheelite, adamite, benitoite and franklinite.